Focus group training is essential if you want to become a professional moderator. A career as an independent moderator – qualitative research consultant - can be rewarding. The money is good, if you know how to sell and keep clients. Plus, you are the boss and decide your time. Corporations spend hundreds of millions of dollars, if not billions, on qualitative research every year. I attended RIVA. It offers training programs for beginners and seasoned moderators. If you attend their basic moderator course, you will moderate a focus group. It’s hands on. I recommend RIVA. Although I‘ve not attended Burke, I have worked with qualitative research consultants who trained at Burke. All have positive remarks about Burke’s moderator training. For training about online focus groups, I suggest you contact ITracks They are the premier service provider of online focus groups. Online focus groups are growing. You’ll want to understand how to run online focus groups, and when to use them. And, several universities offer courses in qualitative research. Check with your local university or college. A background in marketing, sales, management, or the social sciences - sociology, anthropology, or psychology - is useful. Specialization in particular subjects, industries, or markets helps too. Specialization and experience distinguish. I spent two decades in the wireless and communications technology industries. So it is not a surprise, I often moderate groups and depth interviews in technology industries. If you decide on a career as a professional moderator, be prepared to travel and moderate in the evenings. Face-to-face focus groups are conducted in cities and towns across the country. And typically, groups take place in the evenings, Monday through Thursday, when respondents are available. If you are conducting six to eight groups in three or four different cities in one week, you’ll be busy. Keep organized and pace yourself. Decide if moderating is what you want to do. If so, get focus group training at RIVA or Burke. And learn about online focus groups too. Then practice the craft of moderating and qualitative research, keep up with the literature, and learn from experience. 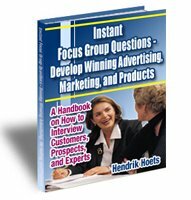 Instant Focus Group Questions is an e-book about qualitative marketing research, packed with tips, techniques, and hundreds of questions. It's a handy 'how-to' book and reference. Click on the e-book to learn more now.